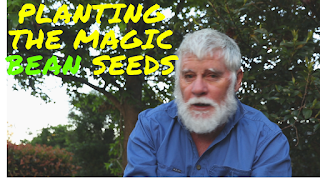 My Veggie Garden: The Magic Bean Seeds by Stewart Dorman. The Magic Bean Seeds by Stewart Dorman. The story of how I rescued some been seeds from oblivion to return them to productive nirvana. Possible the easiest and most rewarding veggie you'll grow in your patch after Radish. So, what are you waiting for, give em a go? Here's a tip I didn't mention in the video, they love a good watering, especially when they are flowering. Labels: growing beans, planting bean seeds, the magic bean seeds. Toowoomba area Backyard Veggie Growers Group. Click below to get My Veggie Garden posts directly into your inbox. I'm happy to answer any of your veggie gardening questions. Just hit the button below and fire away. I can't earn enough driving a cab to do all the things I'd like to do in My Veggie Garden. Blues Radio UK - UK Home Of The Blues - playing the very best blues. Tune in and enjoy the sound of well known and up and coming blues. Improvised ‘cable ties’ from a repurposed plastic bag! Honey without pollen isn’t “honey”?? Born to Knit 2012 blankets – on their way to Vietnam! Toowoomba Community Organic Gardens | Our mission is "to practice and promote sustainable organic gardening and farming in our region."